As it’s the middle of the summer time, we have noticed one thing when we leave our house. That the sun is unbearable unless you are either inside, in your car, or in heavy shade. Since most of the people that own a house don’t usually build a big backyard ceiling that is not sealed off with walls, but is, in fact, a form of a terrace, we are left to either burn in the sun if we want to make a backyard barbeque or to order the food and skip the family and neighborly time we can spend together performing such an action in the backyard. Unless we could somehow block out the sun or in fact any weather situation that we don’t want intruding on our activity in the backyard. Here is where we can start utilizing an amazing contraption that is the tent. Tents come in all shapes and sizes and they are the perfect creation that will help us when we need that extra protection from the rain, or sun when we still want to do something in the backyard with our friends. The silly thing would be to rent these tents for events such as these, but the smart thing would be to buy one and rent it if you want to make your money back. Now tents are not just good for some quality time in your back yard like we mentioned above tents can also be rented out. 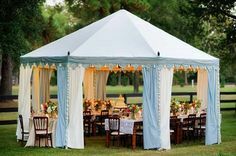 Depending on the size of your tent, you can even make it a wedding tent and rent it as such. Since the wedding market has everything market up when it comes to price, you will be able to make your money back in a short amount of time. But we suggest that you don’t get greedy as you will get more calls if you just simply rent it at a slightly above average price. 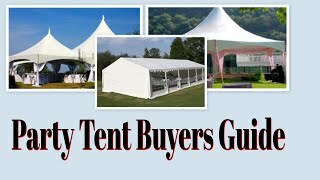 If you yourself want to get af tent for your wedding this can be one of the best investments you can make for your home and your wedding. The fact of the matter is that you will spend several thousand dollars renting a tent for your wedding so why not just go buy one for yourself and then later keep it in your back yard. Depending on the activity you want to host in the tent, there will be a different capacity of people that can fit in the tent. 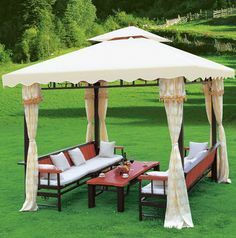 So, for instance, if you want to host a cocktail party a tent the size of 20×30 will be enough for roughly 20-25 people. 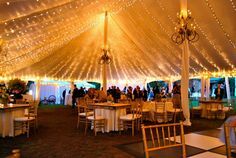 However, if you want to host a dinner party for the same amount of people you would need a tent of at least 25×25 or even 30×30, and hosting something for about 300 people will require you to have at least a tent from 40×70 all the way to 60×100. What you only need to do before you decide will you buy a tent is which one to get. There are three main styles of tents, the frame tents, stretch tents and the peg & pole tents so make sure you get all the positives and negatives of both before you decide which one you will need. Whether you want to rent it for a wedding or camping, we have it all. We realized how useful tent is and sometimes even unnecessarily.